Fears and worries manipulate millions. What is the biblical strategy to beat this chronic problem? "Why do you worry" Jesus Christ asked His disciples (Matthew 6:28). Yet no one had more pressures, demands, dangers and responsibilities to face than Jesus Christ! At infancy He was the target of a demoniacal king (Matthew 2:16). As a youth He had to keep Himself unspotted from the thousand treacherous snares of adolescence and the pitfalls of youthful zeal (Luke 2:52). Even during His ministry, when anointed with the power of God's Holy Spirit, He had to scrupulously avoid saying or preaching anything that His professional enemies could use to shut down His ministry (Matthew 22:15). Yet His words were powerful, authoritative (Mark 1:22). No one else ever walked the tightrope that Jesus Christ endured. At the end of it He died an agonizing death, perhaps the most fiendishly cruel execution ever suffered, with the added bitterness of humiliation, betrayal and loneliness. Yet He taught His own disciples not to worry: "Therefore I say to you, do not worry about your life ... do not worry about tomorrow, for tomorrow will worry about its own things" (Matthew 6:25, 34). The sinless Savior of us all died single, childless, despised and abandoned by human comforts. What keys did He possess to face worry? How may we overcome this nagging, draining concern, this morbid pessimism about the cares of this life (Luke 21:34)? "Be anxious for nothing," Paul wrote to the Church (Philippians 4:6). We all have problems and challenges to meet, especially in trying to disengage ourselves from this hell-bent world, a society so resourceful at finding the weak chinks in our Christian armor. How can we win over worry? Remember that Jesus Christ our example, pioneer of our salvation, faced more than we will ever have to face (Hebrews 2:10, Isaiah 53:4). "For we do not have a High Priest who cannot sympathize with our weaknesses, but was in all points tempted as we are, yet without sin" (Hebrews 4:15). That's why we vitally need God's perspective! Self-help books, professional therapy and clinical counseling can only take one so far. For the ultimate fact is that human life is tragic and meaningless apart from God (Ecclesiastes 1:2). The great men and women of the Bible faced life's toughest issues head-on. They did not shrink from raising the big questions; they did not quake before the ultimate realities. In a day and age where we could face nuclear incineration only 25 minutes from now, we need their strength and guidance. First, ask: "What is the worst that can possibly happen?" Second, consider: "Can I accept the worst if necessary?" Third: "Is there any way to improve upon the worst?" Jesus Christ faced this test in the Garden of Gethsemane (Matthew 26:36-44). He Himself had inspired the grim prophecies about His own cruel death. The mental pressure to escape, to flee, to abandon the work was excruciating. Three times He asked His Father in prayer if there was another alternative to the crucifixion. "And being in agony, He prayed more earnestly. And His sweat became like great drops of blood falling down to the ground" (Luke 22:44). The "agony" here is mental pressure, psychological torture, the kind of inner discomfort we feel when we get unpleasant news or have to face threatening situations or make difficult decisions. That's why the Greek word for agony also means "a struggle." The word Matthew recorded in Matthew 6:25-34, which the Revised Authorized Version translates as "worry," is another interesting Greek word, merimnao. Merimnao is related to meros, "a division," and merismos, "dividing asunder." How accurate! When we are anxious or worried we are disturbing the mind's natural harmony and balance. In effect we are dividing the mind. No wonder we feel inner turmoil and discomfort: The body's defensive system reacts to this struggle (agonia in Greek) going on in our mind. This is why no one likes worry or fear. It is unpleasant. "Fear involves torment," I John 4:18 tells us. Anxiety divides the mind. Some are totally unable to function. Today we say, "They're coming apart." That is what Jesus Christ said not to do. "Do not worry" (Matthew 6:25). Do not merimnao — don't come apart. He faced the worst, accepted it and began to adapt to the new situation — even though it meant His own death. Most of our problems are not nearly that serious, so we should be inspired by His example (I Peter 2:21, Hebrews 3:1, 14, Romans 8:17, I Corinthians 11:1). The catch is, if we do not face life's problems with this strategy, if we don't end the mental struggle by asking, "Can I live with the worst result?" — the penalties are passed on to our bodies. This is psychosomatic disease — the mind dictating its unhealthy mental state to the body through the nervous system. Solomon diagnosed this 3,000 years ago: "For as he thinks in his heart, so is he" (Proverbs 23:7). "He who is cruel troubles his own flesh" (Proverbs 11:17). "A sound heart is life to the body, but envy is rottenness to the bones" (Proverbs 14:30). "A merry heart does good, like medicine, but a broken spirit dries the bones" (Proverbs 17:22). Here is incentive to avoid worry: The damage it does to our health isn't worth it. But what if your worst worry comes true, as so few of them do? What if you're diagnosed with terminal illness or find you are somehow trapped in a situation that can't be cured, but must be endured? What then? The answer is that the same principles that apply to our small worries apply to our big worries. The prescription is always the same — a faith-filled, positive approach (II Timothy 1:7). How can we build this kind of approach to life? How can we learn to handle our cares and worries — the major setbacks in life, or the negativism and meaninglessness that seep into our spirit from contact with this hopeless world? 1) Bathe your mind in the positive emotions — peace, courage, joy, faith. These are all beneficial, pleasant sensations. And it's not just "the power of positive thinking" — pulling ourselves up by our own bootstraps. The real payoff is that God's Holy Spirit, available to us on repentance and baptism, can immeasurably strengthen fragile human feelings (Galatians 5:22-23). Instead of temper tantrums leaving us and others irritable, defensive and self-justifying for hours or even days, learn to replace carnal ventilations with the wiser, more beneficial approach of God's Spirit, the power of true love: "Love suffers long and is kind; love does not envy; love does not parade itself, is not puffed up; does not behave rudely, does not seek its own, is not provoked, thinks no evil" (I Corinthians 13:4-5). How would you like to work for someone like that? How would you like a father like that? Who wouldn't like a neighbor like that? You would? Then be that way yourself. That is the golden rule, after all, and it really works (Luke 6:31). 2) Cooperate with the inevitable and don't fuss about trifles. Even if your worry is serious – a major illness, for example — God's Word offers help and hope. For one thing, Jesus Christ's bloody, mutilated body was accepted as the price of our physical sins (Isaiah 53:5). Healing is promised (Psalm 103:3). Thousands of readers of this magazine have learned that God heals today. So can you. Focus on the big picture (Romans 8:28). One reason God allows diseases and health trials is to remind us that physical, fleshly existence is only a temporary stage in His plan (I Corinthians 15:50). Eventually we will enter a spiritual family of divine, immortal beings (Philippians 3:20-21). That's why Jesus said, "Seek first the kingdom of God" (Matthew 6:33). There is the ultimate, bedrock reality. Sometimes only severe trials can teach us that, but be encouraged. Look for the lesson in trials, the point God is trying to make in your life to help better fit you for eternity. Then you will find that "the peace of God, which surpasses all understanding, will guard your hearts and minds [and help you avoid cardiovascular and mental diseases] through Christ Jesus" (Philippians 4:7). 3) Keep busy and don't waste time on revenge. Trouble has many hidden payoffs (Psalm 119:71). Sometimes severe worries and tests really turn us to God. When we are being criticized and slandered by someone, there's really not much we can do, is there? Only God is our refuge (Psalm 27:1). Try to train yourself to see much of the criticism that comes your way as a disguised compliment: No one ever kicks a dead dog! Maybe you're arousing envy and jealousy. Perhaps you're stirring the hostility of those who are God's enemies, too (Matthew 5:11). Do your best and keep on producing. Of course a wise man criticizes himself, is aware of his weaknesses (I Corinthians 11:31). This helps prevent him from being crushed by outside criticism. Work hard and let God protect you from critics (Hebrews 13:6). 4) Build your health and get yourself as organized as possible. Much worry and nervousness result from poor physical health. God made the human organism tough and resilient, yet we all need to work on our bodies a lot more. It takes some effort on our part (I Timothy 4:8). Sometimes forgetfulness and procrastination generate all kinds of tensions and worries. "Did I forget to call?" "When is the next appointment?" "Does the furnace need cleaning?" "Do I have enough in savings to cover this check?" Get organized. Establish a regimen to run your household and work chores more efficiently. Routine chores can be delegated. Make decisions now if you have all the facts. Deputize, supervise, get the family organized. That which is planned is more likely to happen. We should eliminate any minor worries or mundane details we can. It will give us more energy to tackle the other, major challenges in life. God is not the author of confusion (I Corinthians 14:33). 5) Rededicate yourself to serving others, to a cause bigger than yourself u.s. President John F. Kennedy stirred the idealism of a generation when he proclaimed, "Ask not what your country can do for you, but what you can do for your country." We who produce this magazine are part of a work that is involved with the saving of the human race! Only the Bible gives concrete answers to the problems perplexing this generation. God's Word is the bedrock to build your life upon. Sound farfetched? Listen: There is a Creator God who knows the end from the beginning (Isaiah 46:10). His schedule is ironclad. Peace movements, charities, pro-lifers, nuclear freeze advocates — all the altruistic and noble efforts of humanity will not prevent God from sticking to His schedule, or human events from deteriorating (Matthew 24:22). God's blueprint is simple: warning, Great Tribulation, Jesus Christ's return, salvation. No one can alter this fundamental plan (Isaiah 43:13). Humanity's best efforts always fail. God never fails (Isaiah 42:4). He wants this world warned and educated about His plans for this planet: "The Lord God does nothing, unless He reveals His secret to His servants" (Amos 3:7). 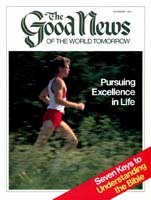 The Good News magazine helps proclaim the world's only sure hope — the world tomorrow under the government and reign of Jesus Christ and His handpicked staff. We must learn the lesson: Serving self never works, serving God and neighbor always does (Matthew 22:36-40)! Sugar Ray Robinson, holder of six world boxing titles in a brilliant career that spanned some 25 years and 109 knockouts, after earning more than $4 million, has found life's sweetest rewards helping to rehabilitate underprivileged youths in the ghettos of Los Angeles, Calif. "I truly believe all my life has been a preparation for this," said Mr. Robinson, "and I'll go to my grave trying to help this cause." We, too, have a cause, a cause much bigger than ourselves. Human life is meaningless unless we take God's overall plan into account (Ecclesiastes 12:8). Man was made to need God, to walk with God and to get busy fulfilling God's ultimate purpose. Readers of The Good News, you have a chance to find that missing dimension. We are helping lay the foundations of a new civilization that will soon be set up on this earth, a world built on the give principle, a society geared to helping others achieve their incredible human potential. Unless we fulfill this purpose, we will always be subject to depression and futility, to the pervading sense of hopelessness epidemic in our society. For we will be trying to find peace of mind on our own, and that never works (Proverbs 3:5). Why not? Because, apart from God, there is no hope of a future life, a life of service and undreamed of usefulness beyond the grave. Armed with this hope of a future of service and accomplishment under God, this sure knowledge of usefulness for all eternity (Revelation 21:7), we can face life's treacherous currents with buoyancy, hope and purpose. With God's help we can win over worry. We can agree with King Solomon, the wisest man who ever lived: "Do not let your heart envy sinners, but in the fear of the Lord continue all day long; for surely there is a hereafter, and your hope will not be cut off" (Proverbs 23:17-18).